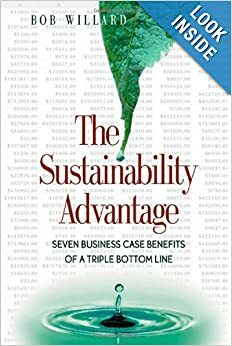 The book explains the foundation of the spreadsheets provided on his website, to allow you to build a strong business case for sustainability initiatives. directors, human resource directors, employees, academia, government agencies, NGO’s, environmental organizations, and consumers (p.13-14). as bottom-line benefits to executives (p.12). If it doesn’t help the business, it’s not on business leaders’ radar screens. The trick is to focus on the “selfish” bottom-line benefits, not the seemingly altruistic societal and environmental results. Environmental benefits can be a happy by-product, not necessarily the initial motivating rationale. 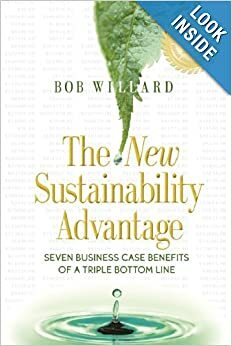 Willard provides an explanation of the differences between eco-efficiency, sustainable development, and corporate social responsibility (p.4). He also provides a 3-legged stool graphic for explaining sustainable development. You might already be familiar with the 3 E’s (Economy, Environment, Equity), or 3 P’s (Profit, Planet, People). He also adds the generic terms (Sustainable Business, Eco-Efficient Business, Ethical Business) (p.6). The “low hanging fruit” for many companies looking for eco-efficiency improvements have already been picked, so a new phase of deployment must be defined and implemented. He likens the current environmental initiative to the quality initiative in the 1980’s, assigned to a specialized staff while the rest of the organization does the “real work,” not a corporate strategy that everyone owns. (p.15). One concern that many companies have is that an environmental initiative will be too costly. If companies undertake projects that meet strict payback and rate of returns, then the initiative can be very successful. What is usually missing is a concerted, company-wide effort to identify and implement environmental projects, along with an education and communications strategy (p.17). He referenced a study by Innovest that showed how environmentally friendly firms (highest rank) outperformed environmentally unfriendly firms (lowest rank) by about 25%. In the worst case scenario, executives should feel confident that focusing on the environment will not negatively impact financial results (p.19). He recommends educating employees, so they can become engaged in the sustainability effort (about 1-2 hours of training per year). Possible topics include: sustainability principles, current global ecological and social issues, life-cycle analysis, design for the environment, and company environmental performance and plans. are concerned about the environment (or 1% overall)(p.26). Here uses a generic company (SD Inc) throughout his book to give examples for his calculations. The company has $44B in revenue, 120,000 employees, $3B in profit, and an average salary of $60,000. After each section, we’ll calculate the savings based on the assumptions provided. Let’s assume that the generic company needs to hire 12,000 people each year. The company would save approximately $840,000 (assuming 12,000 employees x 5% retained employees x 20% employees who are influenced x $7000 cost per new hire) (p.27). The real savings will come with keeping employees from leaving, which he discusses in the next chapter. The cost of turnover (losing employees) has a huge impact on a company, even when you consider short-term savings in salary from the time they leave until they are replaced. He estimates a $10,000 savings in salary in the short term, but a $120,000 negative impact on the company due to: the productivity loss of the employee when they are contemplating leaving, time spent discussing counter offers with company to convince them to stay, payroll and benefits processing, separation allowance, lost experience/knowledge and contact, loss of investment in training they received, potential loss of other employees that follow that person to the new company, and the productivity loss to the department who has to cover for them during the transition. This is just the impact before a new person comes on board. He adds an additional $40,000 to get a new person up to speed (p.32-34). Those costs include: recruiting a new person, training a new hire (corporate and department), setting up a new hire, and loss of productivity within the department. Altogether, he estimates the loss of top talent at $159,000 (p.34). This is consistent with the rule of thumb estimate of 2-3x the employee’s annual salary. For the calculations, if we assume the company loses 1% of top talent employees they don’t want to lose, at a cost of $159,000 to replace them, then those 1,200 employees that stay due to the sustainability initiatives (20% of employees) will save the company $38M (1200 x $159,000 x 20%)(p.39). Big Hairy Audacious Goals (BHAG) get employees going. When employees are motivated, the company succeeds financially. Employees get motivated for many reasons, but when there are extrinsic reasons beyond the company success, that seems to be more effective. Zero emissions, self-sufficient energy production, zero waste, and helping to restore the social and environmental health of the planet would be powerful vision elements for a company. He summarizes the work of 12 different leadership consultants on the value of leadership visions (p.43-46), and explains the Belgard-Fisher-Rayner Commitment model for employees (p.47-48). Therefore, if corporations are interested in attracting and retaining the best talent and in unleashing their creative and productive potential through intrinsic motivation, visibly committing to corporate social and environmental responsibility could yield this competitive edge. How does this equate financially? If 20% of employees were motivated by a company sustainability initiative that increased their productivity by 25%, that would lead to $360M (120,000 employees x 20% x 25% x $60,000 average salary). This would be the equivalant of hiring 6000 more employees (p.53). Many energy efficiency projects have good paybacks, but often times the business case does not consider the potential 6-16% productivity and quality gains associated with reduced noise, more comfort, and better visibility. Have you heard of the Hawthorne Effect? Some critics claim this nullifies productivity gains associated with better lighting conditions, but Willard points to research from Joseph Romm that shows productivity gains could be attributed to these improvements. More and more recent evidence supports lighting changes that increase productivity. In addition, improving indoor air quality can reduce employee sick days and absenteeism, which also improves productivity. Teamwork also increases productivity, and departments and organizations within a company that can align to a common extrinsic goal are more productive. The business case for improved teamwork is based on a 2% productivity improvement across all employees, which equates to $144M (120,000 employees x $60,000 average salary x 2%)(p.56). For improved working conditions, the assumption is a 7% productivity improvement for the 50% of areas that are upgraded to be more sustainable, which would lead to $252M (120,000 employees x 50% of space improved x 7% improvement x $60,000 average salary)(p.58-59). Of all the categories, the manufacturing expenses are normally the only cost savings captured or estimated from sustainability improvements. Even so, not all the costs are fully captured. In fact, most manufacturing processes are extremely wasteful, when looking at how much material actually gets into the final product. This waste is often unknown, or deemed acceptable, and not seen as an opportunity for improvement. A study by the U.S. National Academy of Engineering found that about 93% of the material we buy and ‘consume’ never end up in saleable products at all. Moreover, 80% of the products are discarded after a single use, and many of the rest are not as durable as they should be. There are also additional savings associated with a reduction in hazardous material, such as handling costs, fewer protective equipment, reduced waste treatment, and reduced compliance monitoring. Willard provides a good example of how misaligned goals can lead to unsustainable practices. If price is the only factor for awarding work to electrical contractors, then a contractor might choose the minimum wire size to install to make the bid lower. However, the thinner wire will require more energy to pass through the wire, thus increasing the long term energy costs. The goal should be for the contractor to save money over the long term, not save money in the short term (p.70). Another example of waste is the use of water. One company found that it paid for water four different times (received from the utility, treatment for production, treatment after production, and sewage disposal fees). Wastewater recycling led to savings of $138K, and there were additional side benefits from energy reduction and fewer air emissions. A much larger business case than originally estimated. Being able to identify all costs upfront can increase the number of eligible projects that have a strong payback. He feels that it will be common place for companies to pursue initiatives such as zero waste, zero emissions and zero incidents. Take-back programs will also be the norm, which will not only reduce consumer waste, but allow companies to interact with their customers, learn how their products are used, and ultimately make changes to their designs. These improvements will make impact design for disassembly, and reduce the number of non-recyclable/compostable items at the end of the product life, since companies will now be responsible for them forever. If you work at a non-manufacturing facility (office), you won’t have much savings from the manufacturing expenses. However, all companies have commercial site (office) savings opportunity. These savings come from reduced employee discretionary consumables (supplies), reduced waste handling, energy efficient upgrades (Energy Star), green construction designs, reduced water conservation, lower landscaping costs, reduced office space and reduced travel (examples of all provided in pages 84-98). Success stories at 3M, Dow Chemical, AT&T, Xerox and Oticon are provided. These show the power of employees identifying ways to save money on the little decisions they make every day, leading to millions of dollars in reduced consumables. To estimate commercial savings, a macro level view is again taken. Even though energy costs only run about 2%, most executives overlook these costs (even though these go straight to the bottom line). If you assume that Selling, General and Administrative (SG&A) is about 15% of total revenue, then he estimates about $132M ($44B in revenue x 15% SG&A x 2% energy). This doesn’t even include water or waste reduction. In addition, with employees looking for ways to save, he estimates another 20% in savings off the savings, or $26M ($132M savings x 20% from employee effort). These benefits don’t have to be in the product itself, but can help them end customer be more sustainable (standby mode for electronics, requires less chemicals to clean, etc). These gains in market share or revenue can be aided by outside influences, such as external endorsements from environmental agencies (Energy Star, Cradle2Cradle, USDA Organic label, etc), and “buzz” in the media and social networks about the eco-benefits. These benefits can bring in new customers, increase loyalty of existing customers, or open up new markets or opportunities, as well as innovating new products and services that do not exist today. He touches on the idea of the new trend in leasing products, moving from a production-based model (selling and throwing away) to a service-based model (company maintains and owns the product, user pays a recurring fee). He estimates the impact from revenue growth at 5%, which would increase revenue another $2.2B ($44B x 5% additional revenue). Given that 7% profit margin is achieved on that revenue, then another $150M in profit would hit the bottom line ($2.2B new revenue x 7% profit margin). Willard goes through a few case studies of risks that occurred that had a huge negative impact on a company (IKEA and formaldehyde, oil spills, etc). He spends some time on how insurance companies are taking note of these risks more and more, and the insurance premiums that companies pay are reflecting this, so there is a direct impact on risk to the bottom line, not just some potential risk that is unknown. In my own experience, most risks that actually occur are not complete unknowns, they were known about, and not a surprise to those closest to the problem. What typically happens is that the risks were ignored, or not elevated properly. There are good methodical approaches that can be used to identify and rank these risks (Process Failure Modes and Effects Analysis), as well as much simpler approaches. The key is to identify the risks, and incorporate the top risks into your existing problem solving approach and management review structure. To estimate the impact of risk on a company, Willard uses a simplistic approach, which I also agree with, since risk assessment can vary tremendously by issue, litigation and industry. He estimates 5% of SG&A would be at risk, and improvements would result in 5% of that risk would be saved. This would result in savings of $16.5M ($44M revenues x 15% SG&A x 5% risk of SG&A x 5% of risk avoided). For an initial $300M investment, the company can turn that into over $3 billion annual net benefit, and over $11 billion over a 5-year period.